In the 021516 update to this page I added some photos from owner Rich Pisani taken during a video shoot for Glenn Symmonds. At the time I had not found the actual video. Shortly afterwards Rich emailed me with the link to the video on Youtube. 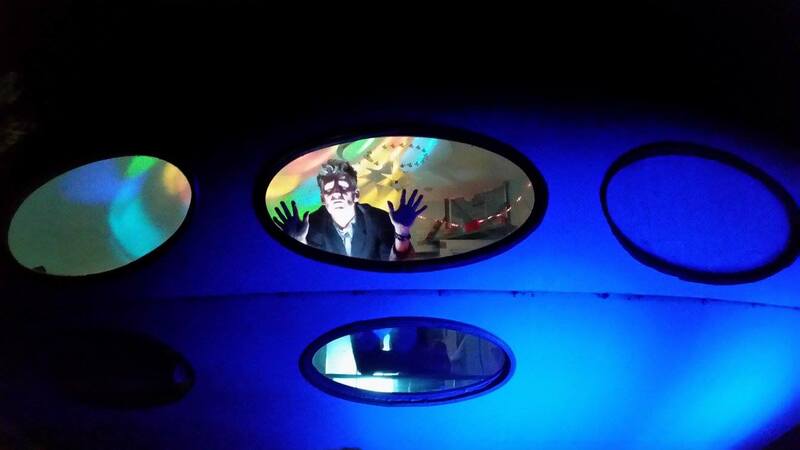 The video, for Glenn Symmonds track "I'm Missing You" is below. The Futuro shows up in the video several times starting at 3:16 and it also features in the credits. Thanks for the link Rich. Facebook is pretty much the dominant "sharing medium" on Planet Earth these days and Rich Pisani shared the photos below showing before and after a fall 2015 "facelift" his Futuro received. The new paint job looks awesome. Rich I hope you do not mind me "extending" your sharing here; let me know if you do. 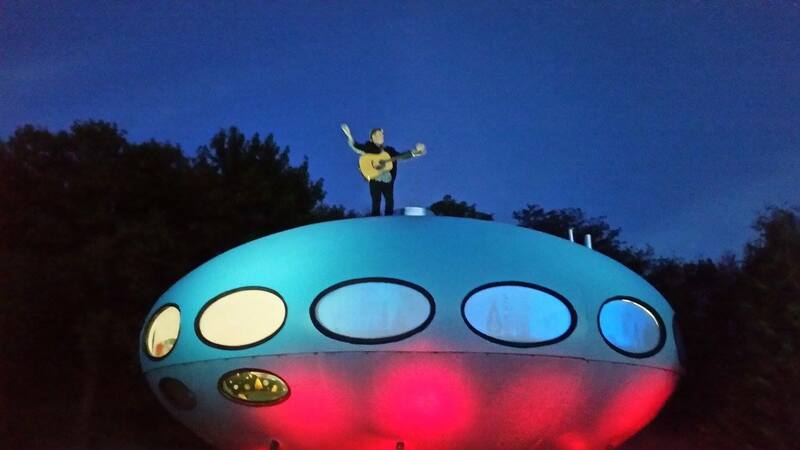 "Thanks goes out to Brother Bob Bogaert and local music legend Bill Porter for sending Movie First Productions my way. 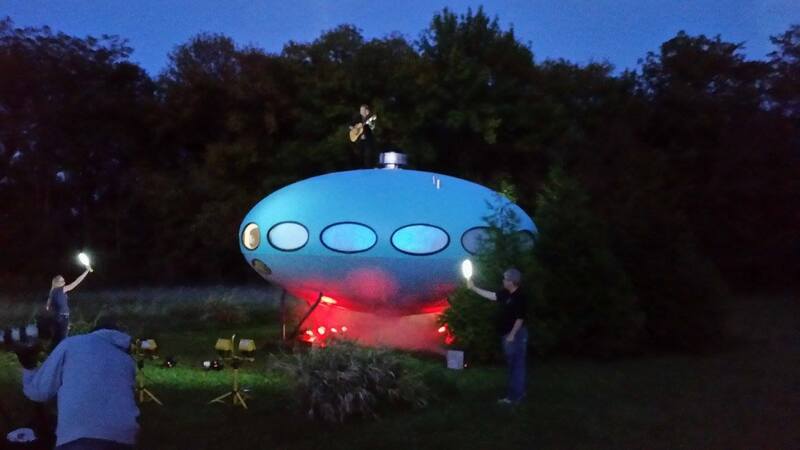 They are shooting a music video for/with Glenn Symmonds (solo project) the drummer for Eddie Money's band, and asked to use the Futuro. Got a chance to use my lighting and hazer. Here are some photos I took." So far I have not been able to find the actual video anywhere. If anyone comes across it please let me know. I can be contacted directly by email or you can use my Contact Form. 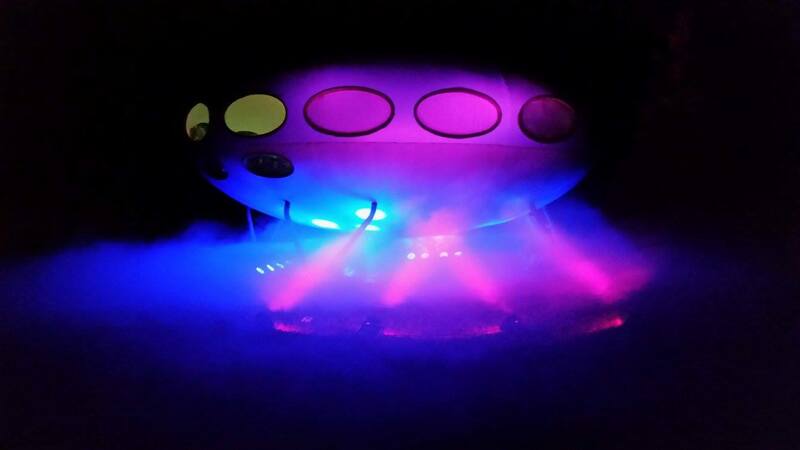 The photos below are from futuro-house.net and were included in some photo galleries that are no longer accessible. However they can still be found using the Internet Archive Wayback Machine. 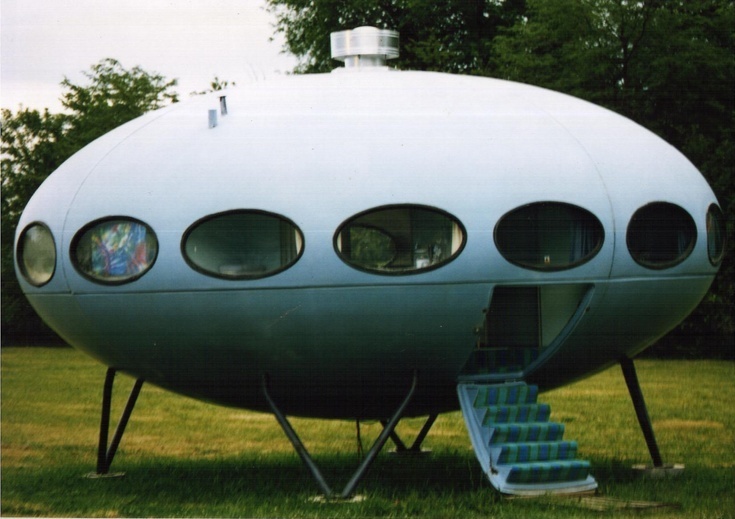 "I can 100% confirm that there was indeed a Futuro house in the lake community (Heritage Lake) just outside of the town of Mackinaw IL. As a kid my family owned property at the lake and every summer we would go camping there and every summer we'd make a little trip down the side roads to see the "flying saucer house" ... 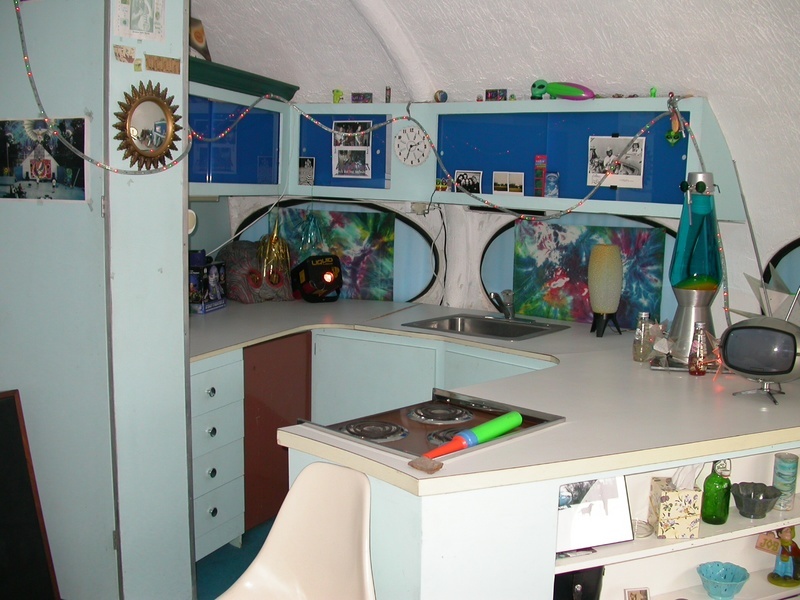 It was used as a little summer getaway "cabin". Whenever we would visit the owners were never there. 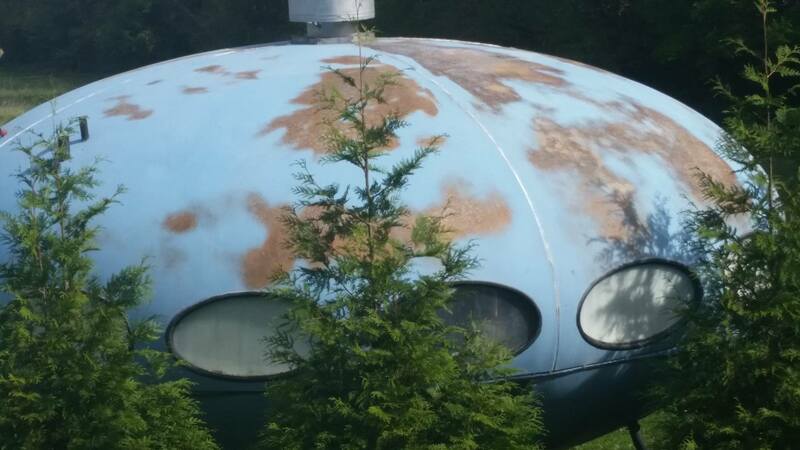 I always hoped to see the inside. 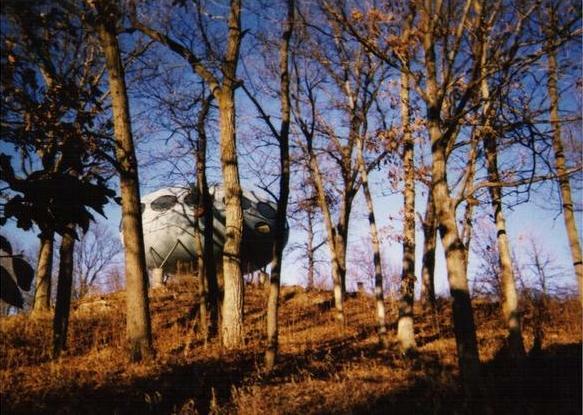 It was perched on the side of a hill (overlooking the water). Going up the hill a bit we could get close to being level with the porthole windows but they were always covered with curtains so we never could see anything inside ... 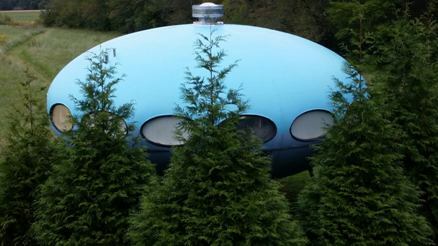 It was light blue ..."
Paul also attached a Google Map highlighting the location he recalled the Futuro being at and a few minutes in Google Earth and its historical satellite imagery confirmed the exact location [40°32'43.39"N 89°19'49.65"W] as of 041898 as can be seen in the screenshot below. 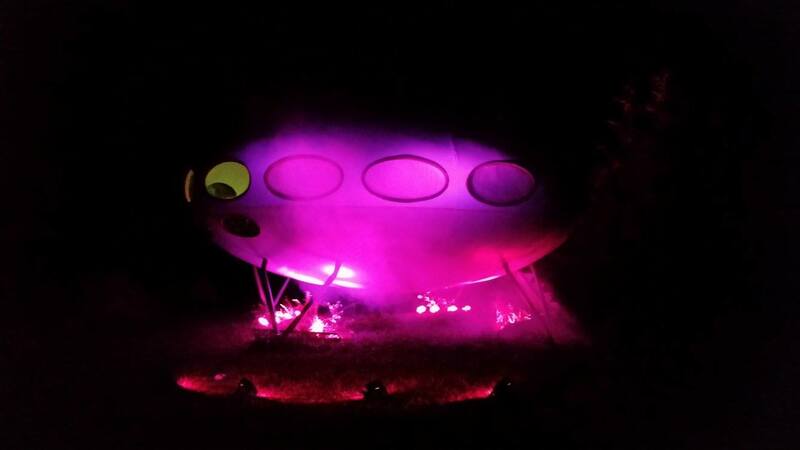 "In addition the last photograph shows the Futuro in a clearly different location; since it is included in the "My Futuro" gallery I am assuming that this image shows the Futuro at its previous [unknown] location." 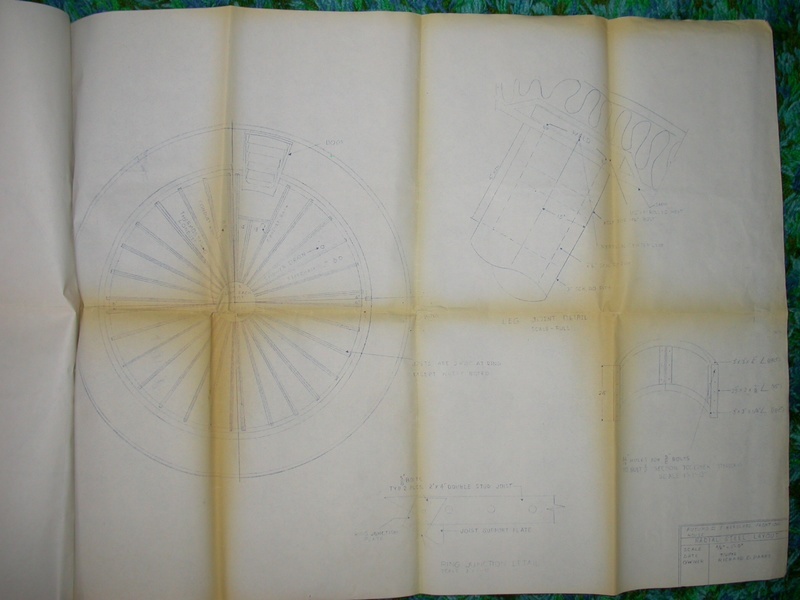 "I think that the Danvers IL Futuro might be the same as the Mackinaw IL (Heritage Lake) Futuro. that last picture shows it on a hill with trees - that is exactly how it was perched near the lake. That pic would have been taken from a bit downhill looking up (away from the lake) at the house. 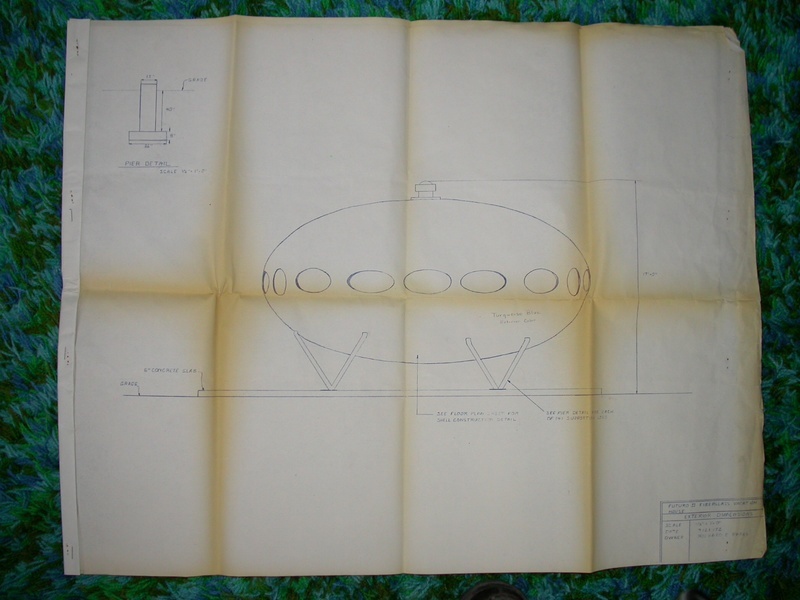 I know it was mounted on cylindrical concrete piers that stuck up out of the ground at least a couple feet, as a kid I crawled around under the "UFO". 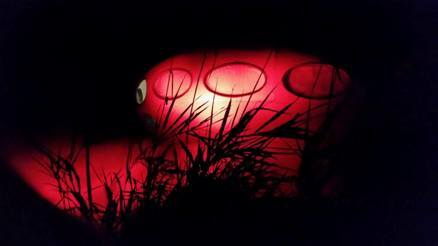 Also consider that its current location is just up the road from the lake location." The picture to which Paul refers is this one. 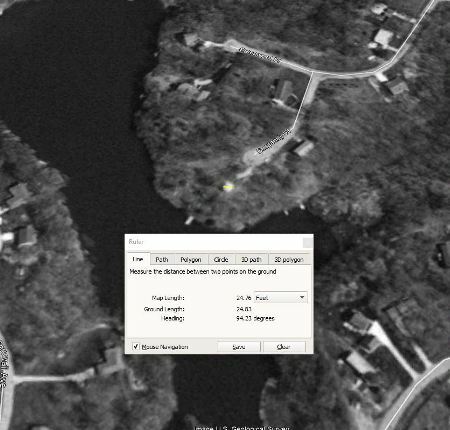 Given that Rich Pisani purchased his Futuro in 1997 after having seen it on a lake in Illinois, the proximity of Heritage Lake to Danvers [just around 10 miles or so apart], the fact that Google Earth imagery later than 1998 shows that the Futuro had been removed from Heritage Lake and Paul's recollection that the Heritage Lake Futuro was light blue in it seems highly likely that Heritage Lake was indeed the previous location of this Futuro. Websites and webpages come and go and sometimes interesting pages can no longer be accessed. 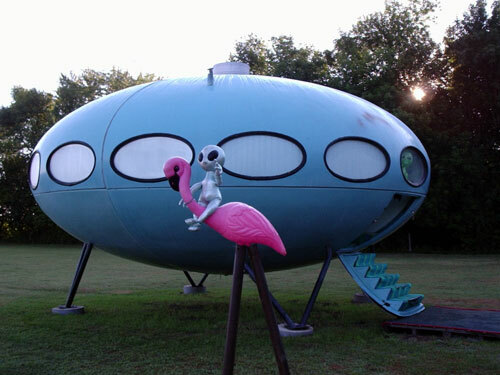 Case in point the photo galleries on futuro-house.net. However with the help of the Internet Archive Wayback Machine sometimes pages that have "gone the way of the dinosaur" are archived and can still be accessed. 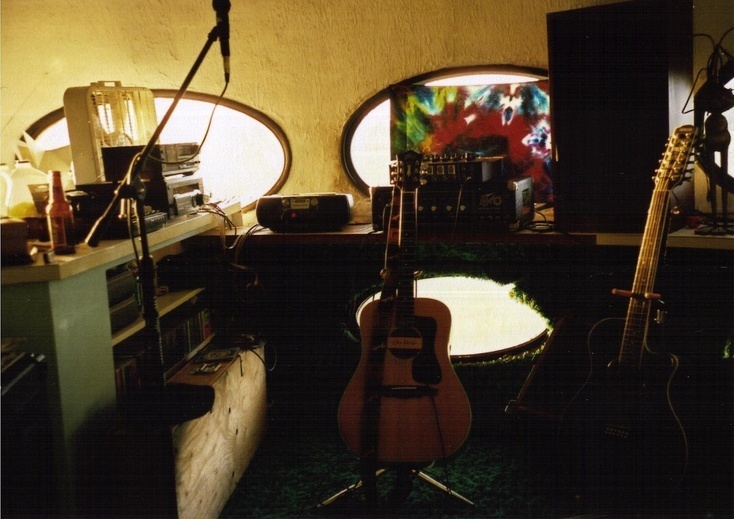 The photos at left are from a now defunct gallery on futuro-house.net titled "My Futuro". There were actually more photos but these are the only ones that seem to have been archived; thumbnails of the others can be seen by accessing the gallery pages on the Internet Archive Wayback Machine using these links - Page 1 | Page 2. 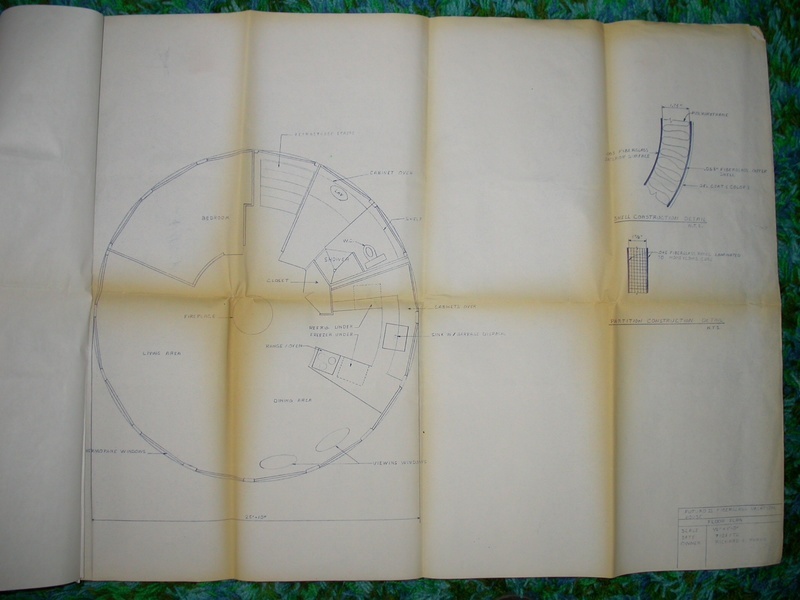 The photos include two exterior views, two interior views and three very interesting shots of Futuro House blueprints. 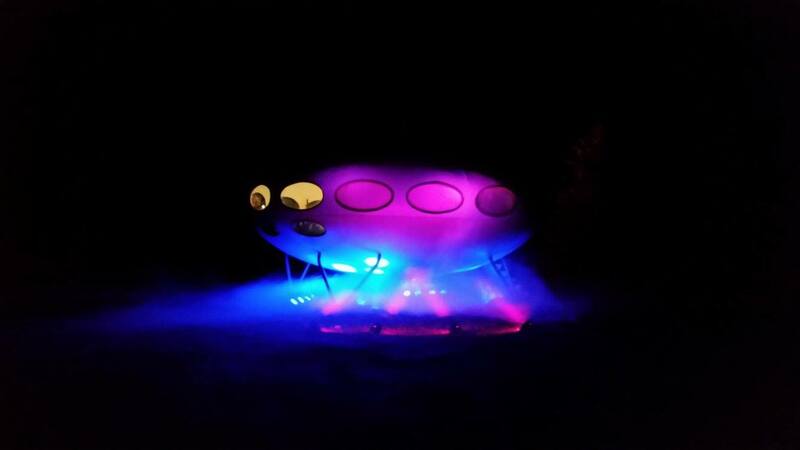 In addition the last photograph shows the Futuro in a clearly different location; since it is included in the "My Futuro" gallery I am assuming that this image shows the Futuro at its previous [unknown] location. On 080505 the Star News, a Wilmington, North Carolina newspaper reprinted the Phil Patton New York Times article referenced below. The article was accompanied by a couple of photos I had not seen before. The article can be found archived by Google News. 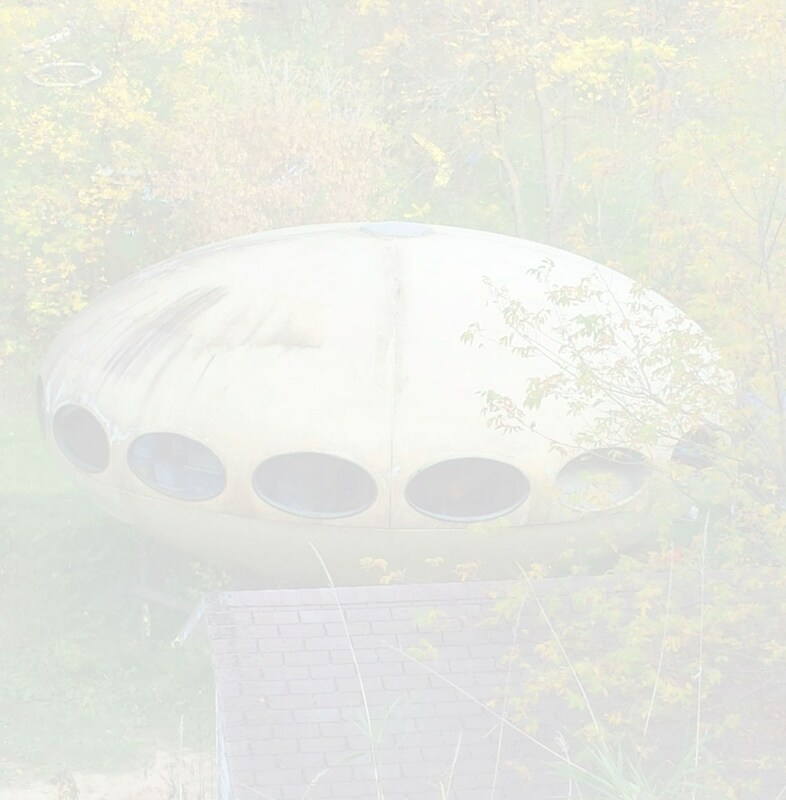 "Richard Pisani caught his first glimpse of a Futuro house beside a lake in Illinois in the early 1980's, outlined against the setting sun. 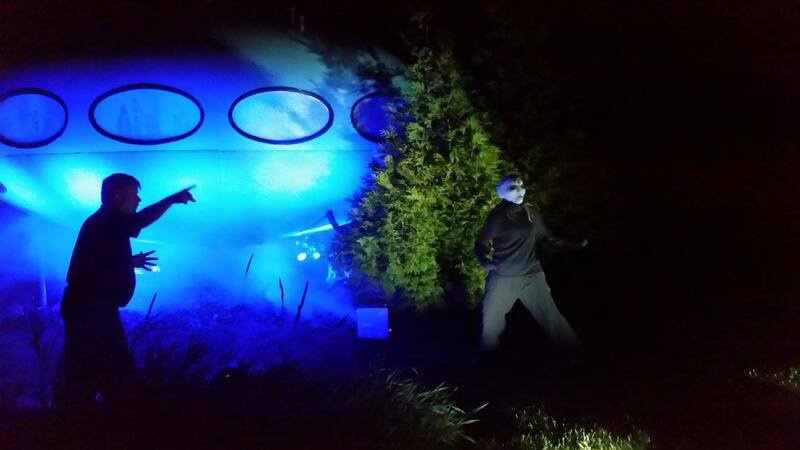 "I was just out cruising and there it was in some subdivision," Mr. Pisani said, "like a prop from a sci-fi movie." 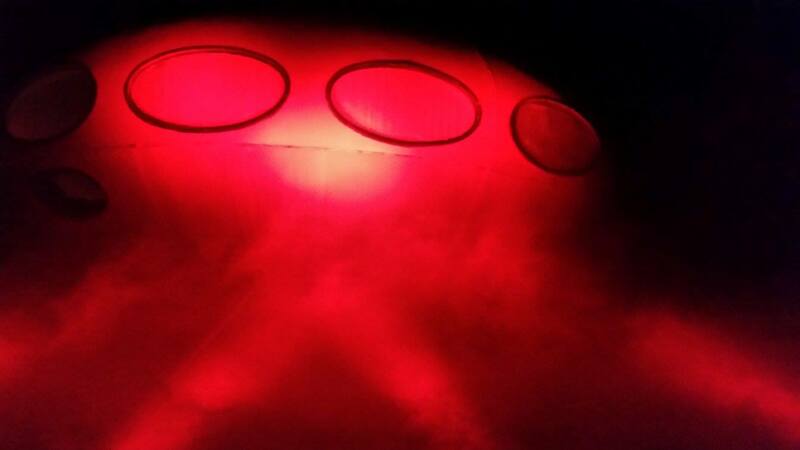 Pisani saw the Futuro regularly over the next decade and more but the die was cast, a "seed" had been planted and it grew and flowered. 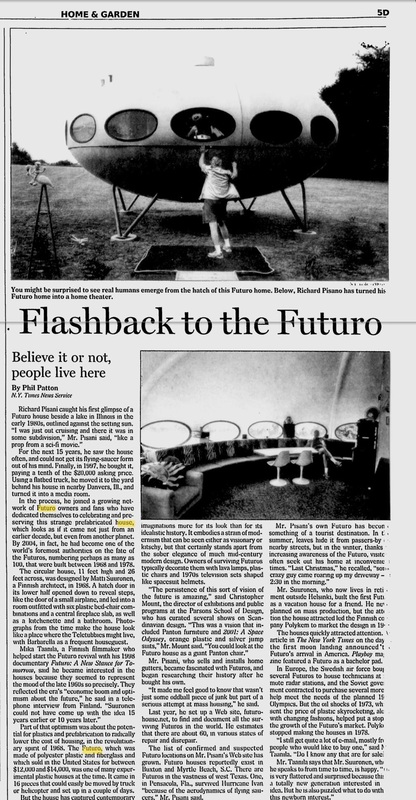 In 1997 Pisani purchased the Futuro [reportedly for $2000 - how things have changed over the years]. 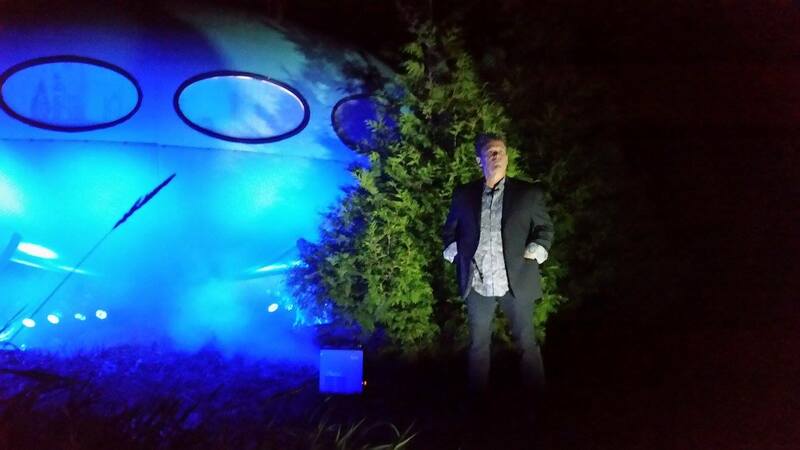 The Futuro in Danvers was restored and turned into a media room but there was more to Pisani and his Futuro than that. 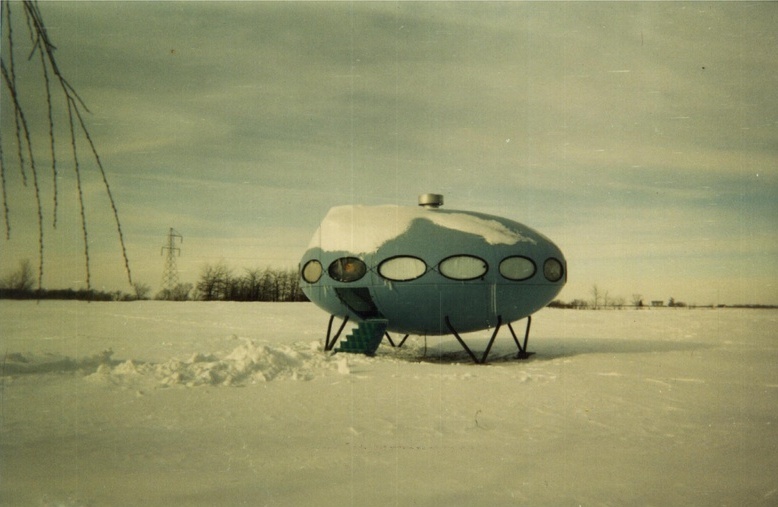 He began to research the Futuro, make contact with other owners and he started to try to track down other remaining examples of Suuronen's iconic creation. 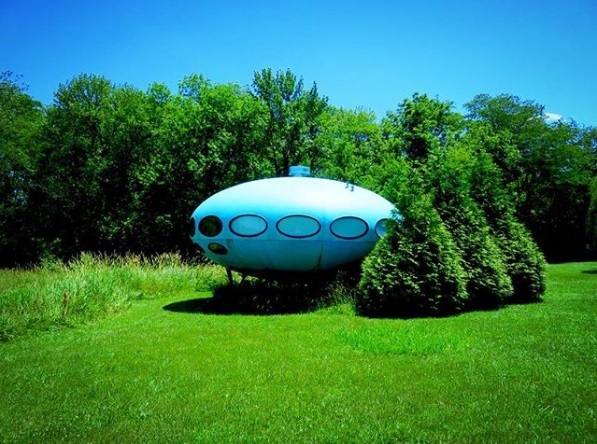 By 2004 Pisani had become one of the world's foremost authorities on the Futuro House and in that year he created Futuro-House.net a website dedicated to finding and documenting the remaining Futuro's. 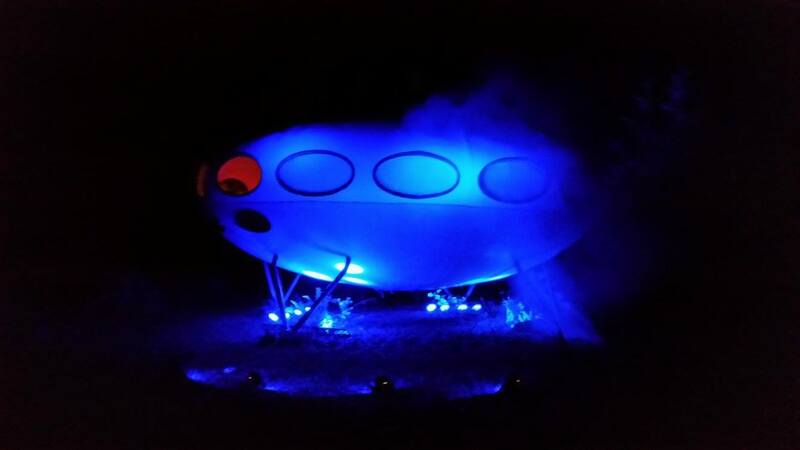 Along the way Pisani was likely the single biggest contributor to a resurgence of interest in the Futuro that has seen many more examples identified, many more fans appear and many more websites, blogs and articles dedicated to the Futuro [yours truly included]. For most part I would say thank you to Richard for that though a part of me "blames" him for the change in the cost of aquiring a Futuro which is certainly no longer $2000, more like $50000 or more [which makes it beyond my reach]. Just joking of course - Richard - I take my hat off to you; keep up the good work. This photograph by huntington_strange_travels taken 063017.